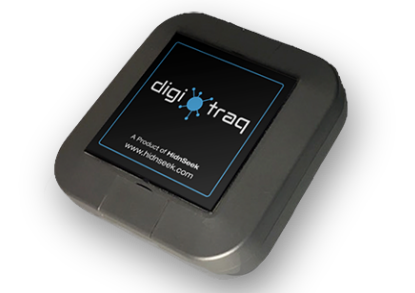 The DigiTraq STA is a rugged waterproof, SIGFOX ready GPS tracking device designed to track non powered assets where ultra long indoor and outdoor localization is required. Simple plug and play operation. We send you login details and you just download the mobile app or use a desktop web portal and you can start tracking immediately. No wiring necessary. Being low-cost, robust, with widespread coverage, great GPS accuracy, no GSM fees, and unlimited power autonomy and permanent connectivity, it is easy to see how this device makes sense. Not to mention it’s full motion sensing, control and alert functions. The web portal allows you to browse the tracker route history. You can pick a date and time in the past and see where the tracker moved to on that day. Inside it has an movement sensor which when activated by movement it will alert your phone through the mobile app. You can also draw out a Geo Fence and if the tracker leaves or enters this zone your phone will again be alerted. All alerts can be activated and deactivated on the mobile app. GEOFENCING: Use app to draw boundaries which trigger alerts. Find out in real-time when a tool leaves a building site, when a vehicle leaves a compound. MOTION DETECTION: Alerts for moving asset to help understand asset usage rate in evaluating idling time. TEMPERATURE: Logged and available. HIGH ACCURACY: (10 meters) Allows for recovery of lost non powered asset. SECURE AND PRIVATE: Unique key for each activated tracker. LOW-COST: Annual subscription. The ﬁrst year is incorporated into the price of the tracker. READY TO USE: No wiring and no conﬁguration OPEN API: Flexibility to develop custom apps and get more value from your trackers. Users can locate all their DigiTraq Edge trackers on mobile devices to see latest positions. They can also create geo-fences for notiﬁcation when the tracker enters or exits a pre-defined area. Users can also set alerts on tracker movement. The DigiTraq SIGFOX Edge GPS Tracker is an autonomous standalone device, built in IP67 rated enclosure to provide ultra-long connectivity. It has an integrated antenna and connects to the Sigfox network straight out of the box, using a unique key for security and privacy. Users simply download the mobile or web app, register the tracker number in the app, and they’re up and running. Share the DigiTraq PV position with multiple users. Attachment accessories included in the kit. The annual 12 month subscription for Hidnseek is the lowest on the market at just €35. The first year is free. Digitraq is new generation new technology extremely low power positioning system using the SIGFOX Internet of Things network which is licensed to VT Networks in Ireland. When first received the Digitraq is setup to report it’s position (when moving) every 10 minutes. This can be reduced down to every 3 minutes for more accurate tracking. The movement sensor is also preset to a default level. This can be made more sensitive or less sensitive remotely with our help. Contact us for more information on this.